Our friends at the music blog The Sky Report are throwing their first annual winter showcase at Tandem (Bushwick) on Friday, February 5th, 2010. Leading the lineup is Brahms, who are fresh off sold-out opening dates with Passion Pit, The Dirty Projectors and Telepathe, Brahms join a bill that also includes Brooklyn electro chanteuse Bonnie Baxter under her new moniker ShadowBox, “epic synth-pop” band Fan-Tan, and ambient electronic artist David Shane Smith from Los Angeles. 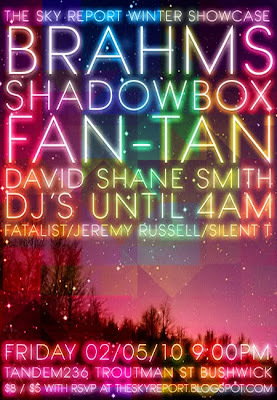 DJ’s Fatalist, Jeremy Russell and Silent T will carry out the party until 4:00am. No advance tickets are available, but rather $8 at the door, $5 with rsvp at http://www.facebook.com/event.php?eid=248157800953&ref=mf or by sending an e-mail with your name and guests to theskyreport@yahoo.com. RSVP does not guarantee admission – first come first serve.